Hyundai is coming to the plug-in hybrid sedan party a bit late. No surprise there. 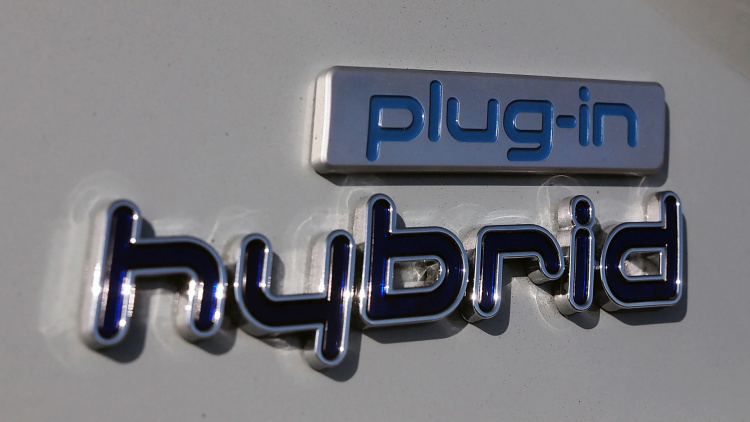 Company execs are fully aware of that fact and were eager to say, "Hey, no big deal," at a media briefing on the new 2016 Sonata Hybrid and Plug-In Hybrid in California last week. The press materials for the new cars offered lots of comparison charts that "proved" (using numbers) that the Hyundais are all-around better than their midsize competition. While Hyundai is at the forefront of the hydrogen fuel cell game in the US with the Tucson Fuel Cell Vehicle, the Korean automaker has a lot of ground to make up when it comes to plug-in vehicles. Good thing, then, that the Sonata is a smooth operator and solid performer out on the road. If you're going to show up late, you better make a dramatic entrance. While I much prefer the distinctive shape of the sixth-generation Sonata, there's nothing inherently bad about the new style in the current models. 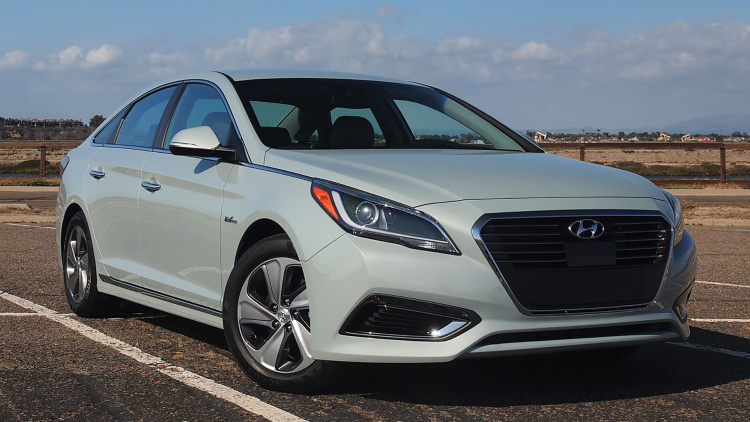 The Hybrid and PHEV update the seventh-gen look of the 2015 Sonata with more aerodynamic front and rear ends, new rocker panels, distinctive headlights and taillights, and eco-spoke alloy wheels. All of these changes reduce drag, dropping the coefficient from 0.27 in the gas-only car to 0.24 for the hybrids. You know what other vehicle has a 0.24 cD? The Tesla Model S. We asked why the standard Sonata doesn't get this slippery update and were told that the improvements came along after the gas model's design had been locked in, but there is a chance some of these changes will find their way to the non-electric vehicle in a future facelift. After spending a day with the new Sonatas, I can say that Hyundai is most welcome at the plug-in vehicle party. The Honda Accord PHEV and Ford Fusion Energi don't get the attention or sales they deserve, and there are some who will say Hyundai got all dressed up for a shindig that's not really worth attending (ever-stricter fuel economy regulations beg to differ). But the more the merrier, in my opinion. And since the Sonata PHEV will indeed be available in all 50 states (with a big caveat) later this year, it won't be long until we see if Hyundai can inject some life into the scene. The main problem is that we don't yet really know how the PHEV compares in terms of MSRP, since Hyundai isn't releasing pricing until some point closer to launch. The automaker did say it expects the PHEV to qualify for a $4,919 tax credit from the federal government. I got to test both the Hybrid and the PHEV (in prototype form) for about 30 miles each on some easy, breezy roads in Southern California, including a blissfully traffic-free I-5. I'll focus on the PHEV here, since it's more exciting, both in the way it drives and as a new product. Visually, it's difficult to tell the two cars apart when you're standing next to them, except for the door covering the J1772 charge port above the driver-side front wheel and some small badges. From inside the cabin, there are only a handful of almost unnoticeable ways to tell which model you're sitting in: the "plug-in hybrid" or "hybrid" label by the digital power gauge, the absence or appearance of an "HEV" button, and a button to release the charge port door. The powertrain, naturally, is where the differences become meaningful. The PHEV's 9.8-kWh lithium-polymer battery will offer an estimated 24 miles of range and 93 MPGe along with 38 miles per gallon city, 43 highway, and 40 combined (final EPA numbers for the PHEV are not yet available). The hybrid's numbers have been confirmed to be 40 city, 44 highway, and 42 combined. Even if you don't care about driving a single electric mile, you should take the PHEV for a test drive when it becomes available. To assist the engine with some electric power from a 1.62-kWh battery, the hybrid has a 38-kW/51-horsepower motor while the PHEV uses a 32-percent more powerful, 50-kW/67-hp unit. This makes all the difference. The PHEV is noticeably peppier, even when the battery is empty, and can drive on electricity at higher speeds than the standard hybrid can. In fact, to fully enjoy this real-world effect of electric boost from a green driver's perspective, I found it better to not think of the Sonata Plug-In Hybrid as an electric car. 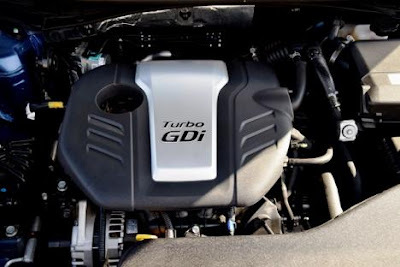 While there is electrification going on, when you need extra acceleration, the 2.0-liter GDI four-cylinder gas engine kicks in far too often, even when the battery has plenty of charge. An engine sort of ruins the EV experience, but this should not in any way be considered a deal-breaker in this package. PHEVs are the very definition of a compromise between pure electric and gas-powered vehicles, but they can offer exactly the right balance of fossil fuel and electric mobility to a wide audience. 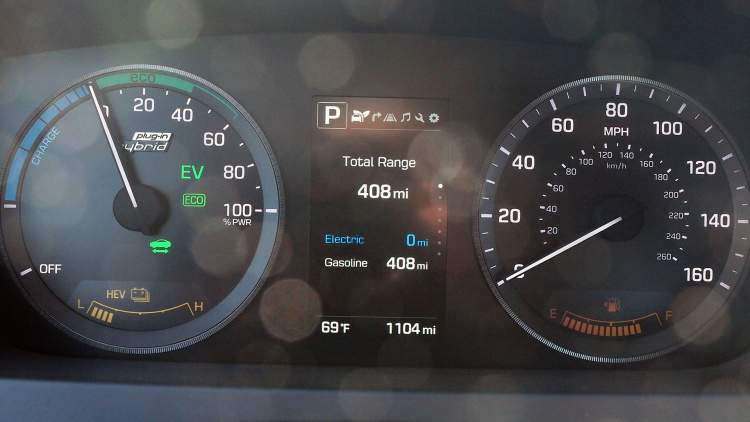 Eco mode is one of three drive settings in the Sonata Hybrid (the other two are Sport and Normal), while the PHEV swaps the Sport for an EV mode. But again, that gas engine came on too many times when I was in EV mode for me to fully enjoy it. The dashboard has some nice eco-minded touches to tell you how efficiently you're driving, and there are two things here that Hyundai should quickly incorporate into the rest of its lineup. At the top of the list is the Coasting Guide Control. This clever teaching tool only works when you've entered a destination into the nav system and, in this early iteration, it's not all that smart, basing its advice solely on upcoming turns. Nonetheless, you can't beat the simplicity: when turned on, a little icon in the dashboard appears (accompanied by a pleasant beep if you want) when you should lift your foot off the gas pedal because it knows that your current speed is going to be enough to carry you to the next turn or stop. Hyundai says following the system's advice will increase your fuel economy up to three percent, but it only works when the car is in Eco mode and at speeds between 37 and 99 miles per hour. Naturally, if you're already a green-minded driver, you're going to be coasting well before the system suggests you ease off the gas. But for other drivers, this a good learning tool. Whether you use Coasting Guide Control or not, the Sonata hybrids are amazing coasters, letting the wheels roll so freely that it doesn't feel like the regen is even working unless you step on the brakes. Second, there's a Driving Style screen. This is a simple tool that shows you how you've been driving since turning the car on. There are three categories: economical, normal, and aggressive. Depending on how you handle the throttle, the car tells you what percentage of the drive you spent with each style. Sure, some drivers will take this as a personal challenge to be as aggressive as possible, but if this sort of real-time dashboard advice were spread across the fleet, I think it'd get people to take better stock of how they drive, and going gentle with the gas pedal can make a difference in energy usage. This is a solid PHEV. One reason it's so solid is because Hyundai has used more high-strength steel in the 2016 model (51 percent of the total mass compared to just 21 percent in the 2015 model). The stiffer body means a better in-cabin experience, where each aspect of the 2016 Sonata is, say, 10 percent better than the older model. Smoothness, quietness, comfort. Everything is just a bit improved. For example, pretty much all the important parts of the powertrain have been made smaller and/or more powerful. The motor in the hybrid is 0.4 pounds lighter but 3 kW more powerful. The regenerative brakes are 11.3-percent better at capturing energy. The engine is 6.5-percent more efficient. The transmission's overall efficiency was upped by 9.5 percent to 54.5 percent. There's a bit more head room and shoulder room. And the turning circle is tighter, so all of this extra efficiency is even easier to move around town. The 2016 Sonata Hybrid has more interior room than the 2015 model – 119.4 cubic-feet compared to 115.9 – and even the PHEV manages to be larger than its predecessor, at 116.0 cubic-feet. The 2016 Hybrid has 13.3 cubic-feet of cargo space compared to 12.1 for the 2015, but the PHEV has just 9.9 – the extra battery has to go somewhere. The trunk is still large enough that I'd be happy to trade some space for the improved acceleration and efficiency of the PHEV. Of course, the PHEV has its own quirks. There's a slight but odd feeling of a transmission shifting when you're in EV mode. If you're used to driving an all-electric, plug-in vehicle, this is not what you expect, but the six-speed automatic transmission is indeed involved in converting power from the motor to the wheels, so get used to it. After 30 miles, the dashboard said I got 34 miles per gallon out of the hybrid. I didn't bother to measure my fuel economy in the PHEV because I spent most of my time behind the wheel charging the battery for our co-driver so that we could each experience a few miles with electrons in the tank. Speaking of which, the PHEV has a battery charge mode. Hyundai's engineers could not give me a simple conversion formula that would tell us how many gallons of gas it takes to generate one electric mile, since that number is so heavily dependent on the engine load and if there's any spare energy available from going downhill. All I can say is that it takes about a minute of highway driving to put one EV mile into the battery. That's like having a DC fast charger on board, because the 50-kilowatt motor can send 360 volts of converted DC energy straight into the pack. By comparison, charging the 9.8-kWh battery from a 110-volt outlet takes around nine hours, while a Level 2 outlet will let you do the job in under three hours using the car's 3.3-kW onboard charger. The cabin's center stack is almost archaic with its insistence on actual buttons. The design isn't exactly futuristic, but I'll happily deal with a basic array of on/off switches any old day if it means there's less fiddling with touch-sensitive surfaces. Plus, clicking down on the "driver only" vent button, which turns down (but not off) the blowers to the passenger and rear compartments to save a little bit of energy, is oddly satisfying to an eco-minded driver. Just as cool is the "auto hold" button, which will keep the brake engaged when stopped and will only release once you put your foot on the throttle. It's worthwhile to remember that Hyundai has been in this late-to-the party position before. When the 2011 Sonata Hybrid was launched in the US, it came after a number of midsize hybrids from other automakers. At the time, it came with a price tag that was below the gas-electric counterparts from Toyota and Ford. Sales started out well, but after a very public fuel economy mistake that resulted in millions of dollars in fees and declining sales of all Sonata models, Hyundai decided that a fresh start was required. This renewal started with the refreshed, seventh-generation, gas-powered 2015 Sonatas, and gets real and green with the Sonata's new hybrid powertrain and new plug-in capability. All I can say is, you're never too late to party on.